The answers aren't that hard to find if you actually look at the plans that have been proposed. 1. The cuts that Obama proposed and passed in the ACA are preserved in the Ryan Budget. In other words, both Obama and Ryan have proposed the same amount of cuts in the program. The difference, as I've said before, is how they propose to go about achieving those cuts. Obama wants to change how payments are made to providers by focusing on quality instead of quantity, e.g. a hospital that has a high rate of patients being readmitted would see cuts in their Medicare payments. 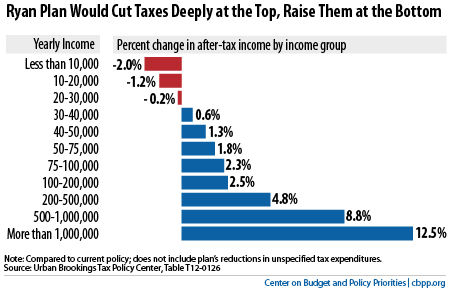 Ryan's cuts come on the side of the beneficiary, i.e. the average American actually receives less over time. Questions number 2 and 3 are easy. The answer for both is GDP+0.5%. That is, both Obama and Ryan propose capping Medicare spending at the same rate of GDP. So now let's take a look at how Ryan is defending his Medicare changes. Here's (video) how Romney and Ryan defended the plan on '60 Minutes' yesterday. Romney: What Paul Ryan and I have talked about is saving Medicare, is providing people greater choice in Medicare, making sure it's there for current seniors. No changes, by the way, for current seniors, or those nearing retirement. But looking for young people down the road and saying, "We're going to give you a bigger choice." In America, the nature of this country has been giving people more freedom, more choices. That's how we make Medicare work down the road. Ryan: My mom is a Medicare senior in Florida. Our point is we need to preserve their benefits, because government made promises to them that they've organized their retirements around. In order to make sure we can do that, you must reform it for those of us who are younger. Ryan and his defenders have continuously said that his plan does not change things for seniors currently on Medicare. He also says that anyone who is 55 or older will not be affected, i.e. they will get Medicare just like it is. The changes will be for those who are younger. There are a few negative effects that I see from this. The 40-54 range. Ryan's plan puts those who are nearing retirement, though not quite there yet in a particularly difficult situation. Many have been preparing for and planning on Medicare for some time, but under Ryan's plan, they would get something different, specifically a voucher that can be used to purchase insurance in an exchange that would include private insurers and the current Medicare plan. This voucher, though, would be equal to the second cheapest plan, in their attempt to spur competition. If, however, someone needs a better plan, they would have to pay for the difference themselves. Those younger than 40. Ryan's plan for Medicare calls for continual cuts to Medicare benefits, that is, the amount recipients of "Medicare" receive through their voucher or coupon keeps going down. Ryan's "GDP+0.5%" is a hard cap that "would automatically lower Medicare spending so that it is below the trigger level." The Obama "GDP+0.5%" cap, though, would be implemented a bit differently. As Kaiser Health News points out: "His proposal follows an effort in the 2010 health law to curb Medicare cost growth by tying the spending target to the Consumer Price Index in early years, and later on to the rate of GDP growth plus 1 percentage point. Now Obama is proposing to lower the target to the rate of GDP plus half a percentage point." The CBO has estimated that under Ryan's plan the average 65-year-old would pay a lot more by 2030 - 68% of their coverage costs versus compared with 25% today. This doesn't seem like a move in the right direction for me. To sum up, Romney and Ryan are trying to sell their proposed changes to Medicare by reassuring current seniors that they won't experience any changes to Medicare, but then he wants to turn the program into one where recipients receive vouchers that have a diminishing return and serve to increase the individual's share of costs. The theory is that they can still win the much-needed senior vote in Florida, Pennsylvania, and Iowa (3 of the 5 oldest states in the country) by getting them to think only of their interests and not those of their children and grandchildren. I think seniors are smarter than that and I think other age groups realize that while they're the ones who would be most drastically affected by the Romney-Ryan plan the GOP ticket only seems concerned about shoring up the senior vote so they can win in November. Only time will tell if the strategy is a winning one.